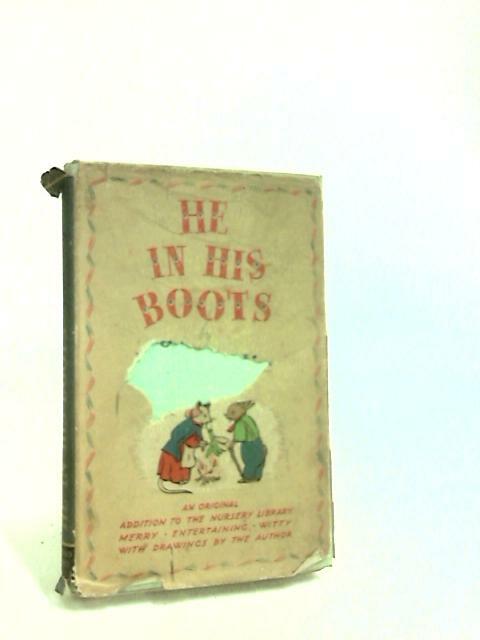 He in His Boots by Wyllie, Jim. 1945. 96 pages. Tanned, pictorial dust jacket with blue spine over blue cloth. Firm binding. Noticeable foxing, tanning and handling marks with dedication to previous owner at front endpaper. Intermittent dog-eared corners with colour illustrations. Noticeable bumping, rubbing and scuffing to spine ends and to corners with noticeable rubbing, scuffing and wear along edges and over surfaces. Unclipped jacket with large tears and missing pieces. Chipping and tears to spine ends and along edges with noticeable rubbing, tanning, foxing and wear over surfaces. Previous owners name at rear.